At Hoggatt Law Office, P.C., our skilled attorneys are proud to provide skilled, responsible representation to clients in Loveland and throughout Larimer County. With more than 20 years of combined legal experience and a long history of success, the lawyers at our firm are equipped to help you with a full range of personal injury and workers’ compensation matters. If you have been hurt on the job or injured in any kind of traffic accident, we will work with you in getting the compensation you need to start putting your life back together. It can be frightening and overwhelming to be injured in any type of accident, but unfortunately, accidents do happen. When they do, you need an attorney who understands the obstacles that may lie ahead. At Hoggatt Law Office, P.C., we believe that a small firm like ours can offer the personal attention and care that is often lacking at larger firms. When you choose to work with us, you are more than a number or the name on an accident report. You are a part of our extended family. By taking the time to listen to you and to get to know you, we can develop an understanding of your injuries and how they have affected you and your loved ones. Doing so allows us to gather the information necessary for building a strong case on your behalf. Our approach has helped us secure many favorable outcomes for our clients and millions of dollars in verdicts and settlements. Let us put our knowledge and experience to work for you. Accidents caused by uninsured and underinsured drivers. We will fully investigate your accident and the circumstances that led to it so that we can identify the party or parties who might be liable. Armed with this information, we will go to work in building a case to get you the compensation you deserve. When you are injured on the job, you are generally eligible to collect benefits under Colorado’s workers’ compensation system. In many cases, injured workers collect their benefits without a problem. In other situations, however, obtaining work comp benefits is much more challenging. Employers and insurance companies may dispute the nature or extent of your injuries or claim that your injuries were not work-related. Burn injuries caused by explosions and fires. Contact our office today to learn more about us and how we can help with your case. Call 970-225-2190 or 1-800-664-3151 for a free, confidential consultation with a member of our team today. 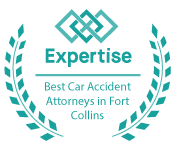 Our firm serves clients in Loveland, Larimer County, and northern Colorado.